Do we stay the same? Cheesy outfits aside, sometimes matching can be nice – when it is worn by people, as a reminder of their connection to each other. Here are examples of sisters who wear matching items of jewellery, but each one personalized to suit their individual styles. 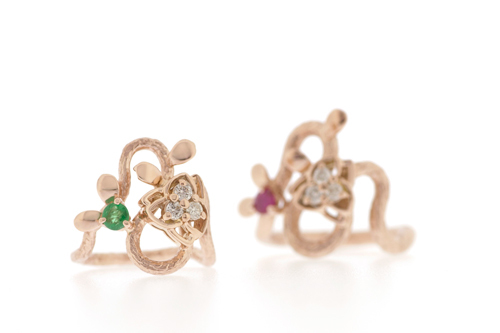 Pinky Rings in Rose Gold, with an Emerald and Ruby respectively. The Diamond centrepieces of these rings are originally from their mother’s old earrings. By resetting one each, they carry with them a piece of their mother, while also matching each other. Green and Pink Tourmaline Cabochon Pendant on Chain. 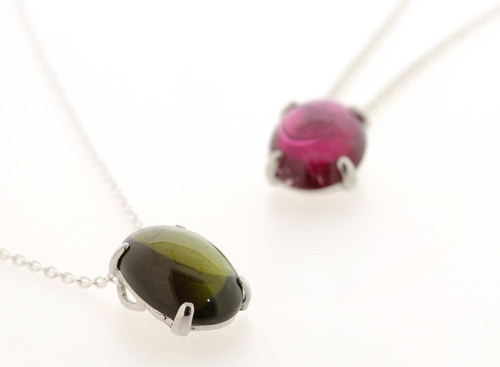 Same design of Pendant, set with different colours and chains to suit individual style. Both these pairs of sisters live continents apart, so it is nice that they have an item that make them feel closer to each other. Are you matching your jewellery with anybody? Hey! I’m at work surfing around your blog from my new iphone 3gs! Just wanted to say I love reading through your blog and look forward to all your posts! Carry on the excellent work!